Two former Winnipeg men are wanted on terrorism-related charges after a four-year RCMP investigation. Known as Project Derken, RCMP uncovered evidence that Maiwand Yar, 27, and Ferid Ahmed Imam, 30, conspired to travel to Pakistan for terrorist training, with plans to later join the insurgency against NATO forces in Afghanistan. Imam is being sought on charges of instructing to carry out terrorist activity and conspiracy to participate in activity of a terrorist group. Yar is wanted on charges of conspiracy to participate in activity of a terrorist group and participation in activity of a terrorist group. Both men are Canadian citizens and former University of Manitoba students with ties to Pakistan, where they both travelled in March 2007. Canada-wide warrants have been issued as the whereabouts of the men aren’t known. The investigation branched out to partners at the Canadian Security Intelligence Service, Canada Border Services Agency, U.S. Federal Bureau of Investigation, and international law enforcement agencies. 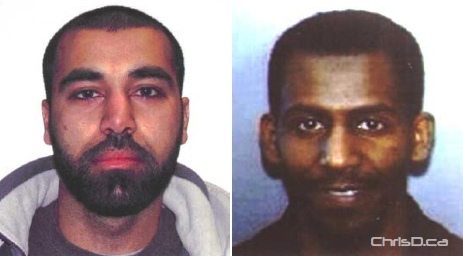 Anyone with information on where Yar and Imam may be is asked to contact the RCMP National Security tip line at 1-800-420-5805.